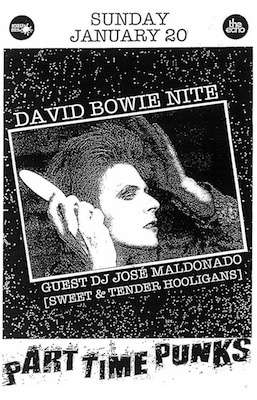 Celebrate David Bowie’s 66th Birthday at the David Bowie Nite at Part Time Punks at the Echo on Sunday, January 20, featuring DJ Jose Maldonado of Sweet & Tender Hooligans. The legendary singer recently dropped a new single and video and is set to release a new album in March. But new hits and old hits alike, no Bowie song or musical collaboration will go un-played at this dance party! 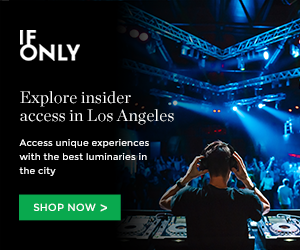 The night’s event starts at 10 p.m., is 18 and over and tickets are priced at $8 via Ticketfly. You can purchase your tickets by clicking here or enter our contest below for a free pair! First make sure you’re following Grimy Goods on Twitter here and/or “like” our Facebook page here. Next, email ggcontests@gmail.com with your full name for guest list and a clever reason why you want a pair of tickets to the David Bowie Nite at Part Time Punks at the Echo! When you’re done with your email, send us a Tweet so we know you entered the contest or you can post on our Facebook wall. We’ll select a winner that has done all of the above mentioned. Winners will be announced via email, Facebook and Twitter on Thursday, Jan. 17. Winners will have until 10am Friday, Jan. 18 to reply back to our email and confirm their win. TWEET: Yo @GrimyGoods, I entered your contest for tickets to David Bowie Night at @PartTimePunks at the @TheEchoLA on Jan. 20! #ContestBowie. FACEBOOK: Just leave a comment on our wall letting us know you entered our contest for tickets to David Bowie Nite at Part Time Punks at the Echo. This entry was posted in Giveaways and tagged contest, david bowie, DJ Jose Maldonado, giveaway, part time punks, sweepstakes, The Echo, tickets contests, win on January 16, 2013 by Emily Saex.